Stewart Harrison Mills passed on from this earth last Sunday, October 25 at his home in Santa Barbara. Stewart was the son of Jim Mills and Mary McLaughlin, brother to James, Patrick and Steven Mills. He was born in Carmel Valley, CA on August 16, 1986. He graduated from Summit High School in Bend, OR in 2004 and UC Santa Barbara in 2009. His last place of employment was The Santa Barbara Independent, where he had just started working as a sales representative. In his short time on this planet Stewart left a remarkable impression among friends, family, colleagues and acquaintances that cannot be overstated. People would marvel at his positive attitude, easy smile and sheer enthusiasm and appreciation for life. Stewart had an uncanny ability to form meaningful relationships with nearly everyone he met. The outpouring of love and support on his Facebook page is a testament to the kind of human being he was: smart, steadfast, loyal, fun, and most important full of love and empathy for others. Stewart loved his mother to the moon and back and would either talk to or text her every day. He was a cracker jack mixologist, working as a bartender and server at several high-end restaurants in Santa Barbara and San Diego. All of Stewart’s friends know of his passion for rock music, especially heavy metal, which you could often hear blasting from the speakers of his beat-up Honda Element as he drove by, banging his head and throwing up the “horns” with a big smile on his face. He was also a very good metal drummer who would spend hours listening to songs to get the intricate syncopations right, jamming with his brother Patrick and his good friend Sean during their college years. 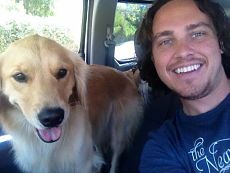 He was a dog lover who most recently formed a strong bond with his roommate’s golden retriever Kaya. Stewart’s passing has left a huge hole in the lives of those that knew him best. He was a truly unique and special young man who left us far too soon, but his legacy of friendship, compassion and lust for life will live on in our hearts forever. There will be a celebration of life in Stewart’s honor this Saturday, November 7, at 11am at Manning Park. If you’d like to attend, please RSVP to the open invite on Facebook so his family knows how many people to expect. RSVP here: www.facebook.com/events/115936268767580.